Joan Holub has authored and/or illustrated over 140 childrens books, including the Goddess Girls series, the Heroes in Training series, the New York Times bestselling picture book Mighty Dads (illustrated by James Dean), and Little Red Writing (illustrated by Melissa Sweet). She lives in North Carolina and is online at JoanHolub.com. Craig Phillips has been creating cover art and drawings for books, comics, and magazines for nearly two decades. He is most at home working on tales about myth and magic. His latest bookGiants, Trolls, Witches, Beasts: Ten Tales from the Deep, Dark Woodsis a 200-page graphic novel about just that! It will be in stores in May 2017. When he is not drawing and writing, he likes to swim in the lakes and walk in the forests and mountains of New Zealand. Visit him at CraigPhillips.com.au. 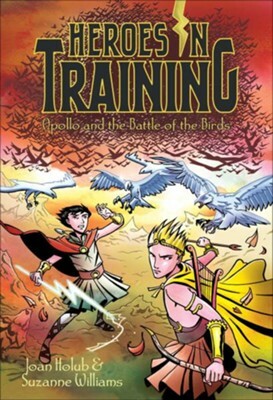 I'm the author/artist and I want to review #6: Apollo and the Battle of the Birds.